We'd like to thank all our clients who have graciously taken the time to write to us and also allow us to post their comments. Below is a sampling of some of the wonderful experiences our guests have had at the spa. Learn more about our treatments and book yours today. I've been a client for electrolysis and skin care since around November 2017. Oksana (electrologist) is very gentle, is extremely knowledgeable, and has a sweet demeanor. Marissa (aesthetician), is friendly and gives amazing facials and skin care advice. The prices for both services are decent. I highly recommend this place! 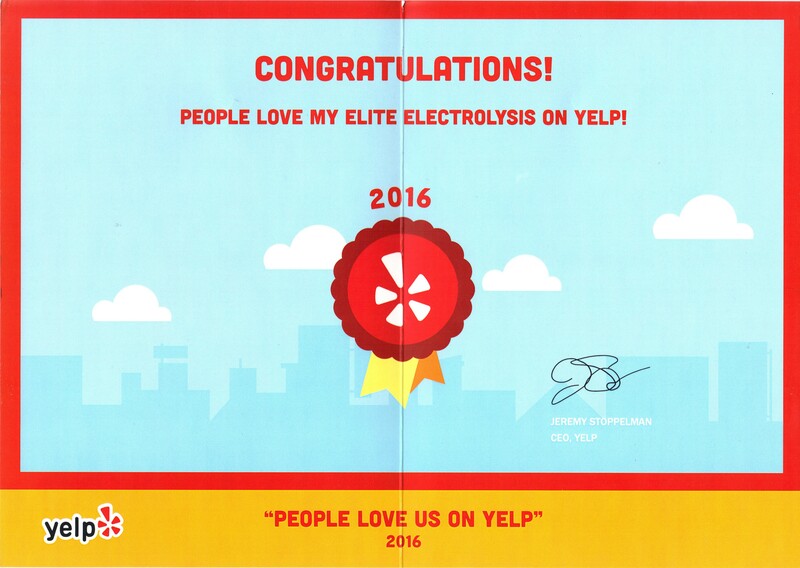 I am consistently blown away by the professionalism and care that is shown by the entire staff at Elite Electrolysis. I saw a difference after one treatment and continue to see amazing results! If you're looking for a one stop shop for all of your skincare needs, this is the place to go! Great place if you have unwanted hair that you want to remove forever. Don't bother with laser ( especially if it is for facial hair) come experience the magic of Electrolysis in the hands of these great ladies (especially Valentyna). I have been going here for the past couple years for electrolysis and if I could give it 100 stars I would! All of the unwanted hair I had and struggled with for years is gone. Going from having to shave, tweeze, or wax every other day to never having to do anything again is worth every penny. Marina and her staff are extremely professional and make you feel really comfortable- I would highly recommend this facility and I would be happy to be a contact point if you would like a reference. Thanks Marina! I relocated to the area so I needed a new place for my electrolysis. This was pricier and a little more painful than what I'm used to but it was efficient. They were able to accommodate me on a short notice and the Lady was very nice. I have been trying different methods of hair removal for so many years. Finally I have found the perfect place that is permanently removing my unwanted hair! My Elite Electrolysis is professional and reasonably priced in comparison to all the other places I have gone. Valentyna is absolutely amazing! She is very flexible with her hours, professional and so knowledgeable. Thank you, My Elite Electrolysis for giving me smooth, hairless skin and confidence! I HIGHLY recommend if you have unwanted hair and are seeking removal to go here and see Valentyna! I've seen Regina twice and each time the service is great. I've already see changes in the growth rate of my hair returning. I'm definitely satisfied. I found this place online and decided to try it out because of the reviews and it was a great decision. My skin has never looked better and I really appreciate Valentina! I am so happy with my electrolysis results! Wouldn't recommend anyone else! So happy to have found out about this place! I have been going to Valentina for about two years now. I was going weekly, then I started going every two weeks, and before I knew it I started going every month and a half or so. My results have been tremendous and I couldn't be happier! Elite is always very clean and smells great. I always have a nice cup of complimentary coffee when I arrive. As far as appointments go, I always book my next appointment after my visit because they do get quite busy. I have never waited for than 5 minutes after my appointment, Valentina is usually always right on schedule! I'm already thinking about what area I should do next! Highly recommend! I have been going to elite electrylosis since November 2012 to clear my chin area and Oksana did an amazing job. I recently started doing my abdomen region with another practitioner because of work related issues and the practitioner did a horrible job. I have developed a lot of hyper pigmentation plus folliculites because she wasn't inserting the needle properly. After about 3-4 treatments, I had enough and decided to go back to elite and I'm going to stick with it. Biggest mistake ever was going elsewhere when I already have best in town. I explain my nightmare to Oskana and she was very understanding. Elite is the best in New Jersey by Far! This place is very professional. I just started coming here about 2 months ago for electrolysis and I already see a big difference. Very happy with the results! Will continue to go weekly. I have been to a few different specialists and I have to say that Elite Electrolysis is great at what they do. I use to go to someone also in Fair Lawn for about 8 or 9 months or so and honestly the results were not as good. I had faith and thought well maybe because of my hormones it will take a while. A couple of months ago I decided enough is enough its a lot of money I should probably look into someone else and I finally found this place. I highly recommend this Electrolysis office as a Godsend!!! Also their place has great customer service unlike the last one I went to, night and day. I saw results after just 2 appointments, I know I couldn't believe it myself but it's true this place is amazing. When you have an issue like this and you find some one as good as this place trust me you will be amazed! Elite Electrolysis is a God sent. For anyone who has ever struggled with embarrassing, unwanted, coarse, hard to remove hair, this place is for you. I struggled for years with coarse facial hair and years of time consuming, tiring and inconvenient tweezing. Only to wind up with a dark shadow around my chin area that was getting progressively worse. After doing lots of research (laser, and other hair removal treatments) I decided to try electrolysis. I was a lot nervous and apprehensive but made my consultation appointment anyway. I was immediately put at ease and I believed that my hair free goals were within reach. After my first treatment, I saw a difference and after the first several, I couldn't believe my eyes. I no longer have to spend hours in the makeup mirror tweezing or have to be ashamed about my "five o'clock" shadow. Ladies (and gentlemen) don't suffer anymore. Step out on faith and give them a call. I promise you won't be disappointed. Hair on ones body is normal. However, as a woman, hair on my abdomen (stomach) was not normal nor wanted. For years I tried everything known to get ride of the hair. I've shaved, waxed, tweezed, and complete 9 treatments of professional laser hair removal. Nothing worked and only served to cause skin irritation and or scaring on my darker skin (African American background). After being unsuccessful with laser hair removal, I again started researching permanent hair removal treatments and discovered the facts related to electrolysis. After conducting a google search of an electrolysis within my radius, I came upon Elite Electrolysis and decided to make an appointment for a consolation. During the consultation I met with Marina who was curtious and explained the process as well as demonstrated a brief session. She explained that the process would take time and commitment but would lead to results. Honestly, I was skeptical due to my history of unseen permanent results. After thinking it over, I made my initial appointment with Marina at her West Orange location and never looked back. After clearing my abdomen area in the first 3-one hour sessions, I began to notice a difference, the hair actually took a longer time to grow back. After about 5 sessions, we moved from weekly to bi-weekly. After about 10 treatments the hair was disappearing and I needed an appointment only once a month. I am now on my 15th treatment and can honestly say, I am no longer embarrassed to show my stomach. My appointments are now once a month or as needed and usually last under 20mins, seeing that there are just a few stray hairs. This has been the only method that has worked for me and has been truly permanent. After initially questioning the process during consultation, I am not a believer and am greatful to Marina for her professionalism and expertise! I was introduced to Valentina Tabaka through a friend who highly recommended her as a true professional. Now, I have thick hair and I tried various other methods of hair removal (waxing, shaving, etc), and to be honest none of them worked to my satisfaction. All these methods work in mediocre scale and with with diminishing results. After I met with Valentina, she patiently explained me in detail the entire process, step-by-step. She has a medical background so, all my questions were answered from a professional point of view, in a clear and consistent manner. I have only couple of treatments left, but I must say that this was the best decision I've ever made. I do not have pigmentation anymore, my skin is smooth, clear and literally all my friends are asking what is I did to get that beautiful skin. Let me tell you, if you like me suffer from thick hair, electrolysis is your best bet. Better yet, go see Valentina, this will be the best decision you've ever made!!!! This is a painful subject, getting stuck with a needle...and My Skin Care and Electrolysis does a painless job of it. Great professional service, skill and results. I highly recommend them! For those doubting that electrolysis works, well, let me tell you, it does. I've been going for about a year now and the hair I wanted gone is much thinner, finer and some doesn't even grow back. The word the ladies do at EE is wonderful. My first visit included a free consolation of how the treatments would feel and it wasn't too terrible. You know what they say, beauty is painful. The lady who takes care of me is talkative, polite, and very good at what she does. We have conversations while she does the treatments, so the staff if incredibly personable and knows what they're doing. They have flexible schedules, too. If anyone needs any hair removal, I highly recommend Elite Electrolysis. The embarrassing hair that grew as a result of my hormones is going away and I feel more confident in myself because it's gone. Excellent customer service! Excellent results and excellent staff! I've been struggling for years to remove unwanted hair. After years of bleaching and many different painful laser hair removal treatments, I finally found this office for electrolysis. Everything is clean and done so well. I truly enjoy my time as I'm getting treatment done. After trying every form of hair removal, it's clear electrolysis is the ONLY method that is permanent! The team at Elite Electrolysis was not only friendly but super informative! Marina and her team are the only people to trust with your skincare needs. After only a few sessions, my unwanted hair is all gone. Stop wasting time plucking, waxing, etc. Electrolysis is the only way to go. The place changed a name and now is called MY skin care. The same excellent service and staff. Now that I do not have an unwanted hair I still go to them for my skin care needs and eyelash extensions. I got my first session at Elite Electrolysis in Fair Lawn and I must say I was nervous about the pain. I've been dealing with unwanted hairs for a few years and as a women very embarrassed of it. I was not in pain I had a comfortable experience and can't wait for my next appointment . I'll make sure I write another review if it works keeping my fingers crossed sincerely S.
After so many years of no results and hairs coming back, I finally found the right place. On one hand I'm upset that I wasted so many years and money, but on the other hand just after a few visits I'm glad I finally clicked on Elite's website. Marina has helped me see the light at the end of the tunnel. I have been to an electrolysis before her and that electrologist would continue to tell me that I was almost done and that was never the case. Finally, after 3 years of empty promises, I decided to find someone else. I was doubtful when I first talked to Marina because of my prior experience, but she proved me wrong. After a couple of treatments, I saw a major difference on all the parts that were worked on and now I am done. Thank you Marina for making a difference. I am so glad I followed up on a personal referral given to me. After endlessly surfing thru all hair removal forums, I was still not sure if electrolysis was for me. Thank you very much for patiently answering all my questions and most of all for helping me to overcome my hair problem. Results are amazing !! Marina, I am so happy I came to your office. I would be happy to recommend you to anybody. Thank you so much! MY Electrolysis Hair Removal has been selected as the 2015 Best Business of West Orange in the category of Hair Removal. Copyright © 2015 MY Skin Care Center, Inc. All Rights Reserved.